Whether your organization has an enterprise multicloud environment or is exploring cloud options for the first time, selecting the optimal Hybrid IT mix is becoming increasingly difficult. How you evaluate multiple cloud scenarios can be the difference between success and costly repatriation. For organizations considering moving applications to the cloud, selecting a cloud provider can be a daunting task. Using cloud provider online calculators, creating spreadsheets, and modeling your scenarios to compare different options can be confusing, time consuming, and expensive. 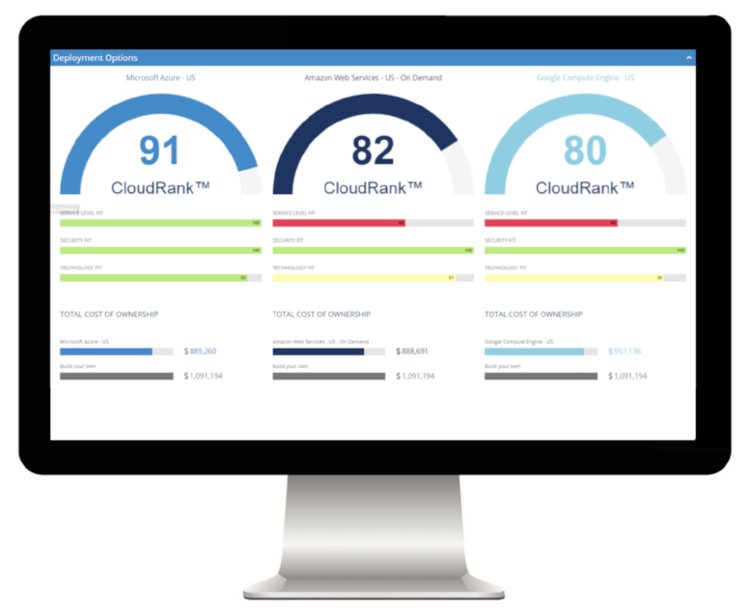 To demonstrate how CloudAssist ™ can help your organization streamline cloud decisions, complete the four step process to view your CloudAssist ™ scorecard and download the detailed report in just minutes. Avoid repatriation. Let Brookey & Company and CloudAssist ™ help you develop a Roadmap for success. Focus on business outcomes is a key ingredient to any successful business transformation project. Whether your organization has an enterprise multicloud environment or is just exploring cloud options for the first time, selecting the right technology is a critical factor in achieving your desired business outcomes. Let’s begin by examining your current interest in cloud and associated workload type. Based on your workload type, this step will further define a configuration to meet your organization’s application technical and sizing requirements. Compliance and Security are key factors in the decision to migrate workload to the cloud. Depending on your organization, compliance requirements can vary widely. Securing your customers information is critically important. Select the Compliance and Service Level requirements unique to your organization. Which concerns, if any, are important for your application workload? Based on your input, by clicking Generate Scorecard you can view your recommended deployment options with Service Level, Security and Technology fit and Total Cost of Ownership including the “Build your own” costs. To receive a report containing detailed information behind the scorecard simply enter your email address and click send it. This scorecard is a summary of recommended deployment options based on your selections. If you would like to receive a full report containing all of the details behind this scorecard, please provide a valid email address and click "Send It!" Do you want a detailed report? CloudRank™ is a registered trademark of CloudGenera, Inc.